FUTmas is a yearly event created by EA Sports to celebrate the Holiday season. 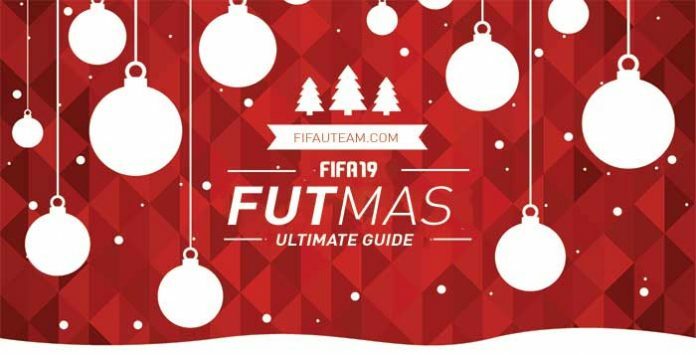 In this guide, you will have the chance to know everything about the FIFA 19 FUTMas event, including the expected release date, the estimated offers and the answers to the most common questions. What is a the FIFA 19 FUTMas Promotion? FIFA 19 FUTMas is a festive promotion created by Electronic Arts to celebrate the Holiday season. As usual, EA do not miss the chance to boost their sales and releases a variety of offers. During the event there is always something new to everyone. FUTMas offers usually include all day Happy Hours, lightning rounds every hours on specific days (limited amount of packs to be sold; the first to come is the first to be served), an exclusive kit, dozens of new squad bulding challenges and themed weekly objectives. New FUTMas themed cards are also introduced in the game. This promotion, which runs alongside 19 Days of FIFA, is very important to the community because it is the last one before the TOTY release and also because it includes really valuable offers. When the FIFA 19 FUTMas promotion will be released? What happens to the cards’ prices during FUTMas? The FUTMas promotion has a significant impact on the FUT 19 market, especially on days when the best packs are released (December 24-26). On these days lots of packs are sold and many new gamers start playing the game. Since there are more cards on the market, the prices are lower. Q: What is the FIFA 19 FUTMas? A: FIFA 19 FUTMas is an event that Electronic Arts organises to celebrate the holiday season. It includes very interesting offers . Q: When is the FIFA 19 FUTMas? A: The promotion runs from 14 December 2018 (Friday) to December 31 (Monday). Q: What can we expect from FIFA 19 FUTMas? A: Daily SBCs, promo packs, new squad building challenges countdown, exclusive kits and themed players cards. Q: What are Lightning Rounds? A: Lightning Rounds are new rounds of happy hours every hour in which promo packs are available on the store until they run out. On Lightning Rounds there are a global limited amount of packs to be sold. The first to come is the first to be served. On other hand, without a limit of packs for each user, you are free to buy how many promo packs you want as long as they are not sold out. Q: When Lightning Rounds will take place? A: Lightning rounds may take place at any time. Q: Can we expect 100k Jumbo Rare Players Packs? A: Yes. These packs are usually released during the FUTMas promotions. Q: Will EA Sports release free packs to everyone during FIFA 19 FUTMas? A: They didn’t release free packs in the two previous years. Q: How can I get a FUTMas player card? A: These items are only available via squad building challenges. Q: Where I can see which offers are assigned for each FIFA 19 FUTMas day? A: You can check in this page the complete program as soon as it becomes available. Q: FUTMas and ’19 Days of FIFA’ are the same thing? A: No. The only thing they have in common is that they are released during the Holiday season. During the ‘19 Days of FIFA‘, Electronic Arts offers special gifts to their social channels followers.